Samos is an island, which combines history, stretching back t� prehistoric times, and tradition with natural beauty and is truly an ideal place for holidays. �he images here so vivid and interchangeable as you take a walk in the island's woods, across its plains, as you climb to the tops of its mountains and descend its ravines towards the seaside. A variety of sites await visitors of every culture and interest such as sunny beaches, archaeological areas, monasteries, wildlife and fauna and flora. But you are more likely to fall in love with Samos when you establish relations of friendship with its hospitable people. . The island of Samos is the eighth biggest Greek island and lies in the heart of the Central Aegean, 1,200 metres from the shore of Asia Minor. It is shaped like a peninsula, and according to the geologists from various geological upheavals, which occurred during the centuries, cut of this piece of what have been the Asia Minor Coast. Samos has the highest mountains in the Aegean. Mount Kerkis with its wild beauty is ideal for climbing, while Mount Karvounis is more accessible. In general the island is ideal for walking in nature and examining its wild life. The Prefecture of Samos, which apart from the island itself, includes Ikaria and Fourni, has a population of 45,000. Apart from its famous wine, it produces and exports olive oil, vegetables, fruit, citrus fruits, honey, ceramics and fish. The island has a temperate climate, mild in summer and cool in winter, while its fine beaches are bathed in sunlight eight months of the year. Samos is the birthplace of the great mathematician and philosopher Pythagoras, whose theories had great effect �n mathematics. In ancient times, a major culture developed �n the island and it was the home of distinguished figures in the world of the arts, literature, philosophy and of thought. 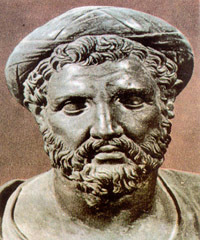 The great astronomer �f antiquity Aristarchus, a pupil of Euclid, was born and worked on Samos. Aristarchus was the first to claim that the earth moves round the s�n, and at the same time revolves on its own axis. Hera, the goddess �f fertility and childbirth, was worshiped on the island and a hundred-foot temple dedicated to her was built during 7th century BC. The ruins of the temples can be seen in the area of Ireon (Heraion), whose name has been taken from the goddess. 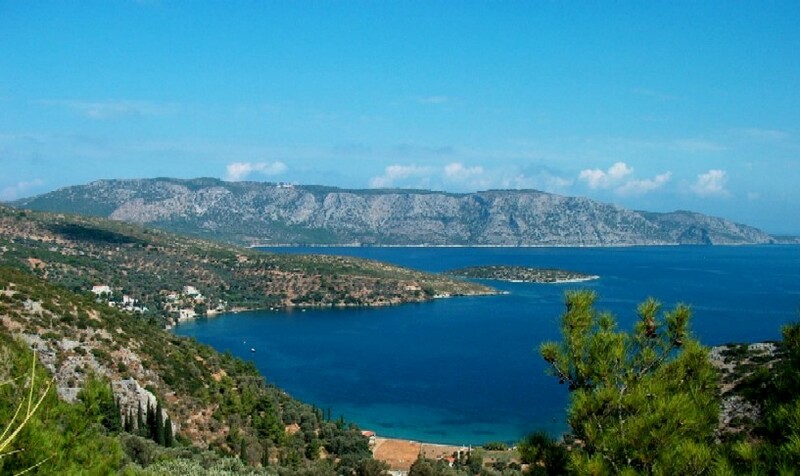 Mythology also claims Samos as the home of Poseidon, god of the sea, of Dionysus, and of ���ll�. Although small in size, this island is known throughout the world for its wine. Dionysus, god of wine and of the vine, had a special affection for the Samiots and taught them viniculture. 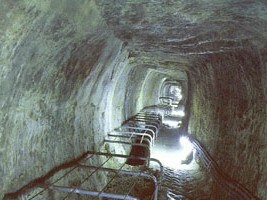 The famous Tunnel of Eupalinus said to be �8th wonder� of the ancient world is one of the most astonishing sites in Greece. The architect Eupalinus constructed it in 550 BC under the reign of the tyrant Polykrates. The Natural History and Palaeontological Museum is unique within Greece and exhibits bones of fifty different species of proboscidean mammals that had come from Asia when the island was still a part of the continent. The most impressive exhibit is the �Kaplani of Samos� (wild cat related to the tiger). Heraion (Sanctuary of Hera) the island's chief ancient site; and the Byzantine Museum with heirlooms from Samian monasteries. 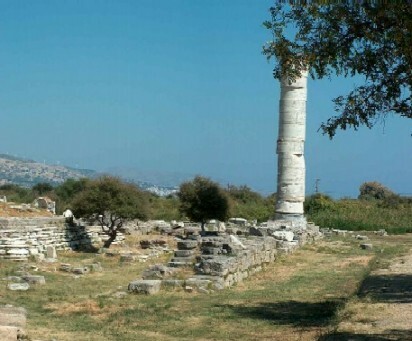 The Archeological Museum in the town of Samos is one of the most important in Greece. The rare archaeological findings exhibited there include the statue of the Kouros (young man), the largest 'kouros' statue in Greece. This sculpture, which is three times life-size, consisted of a single piece of marble, weighing 4.5 tonnes, though it was in fragments when it was found. Herodotus tells us that the Kouros was dedicated to Apollo.